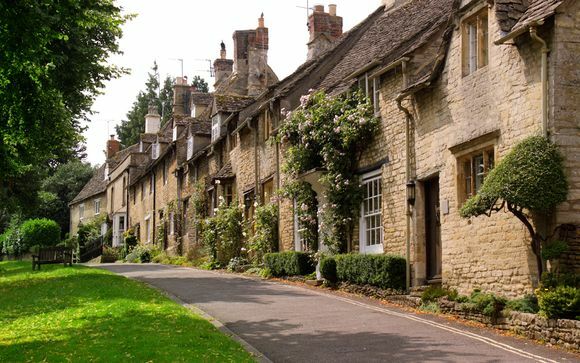 Burford is a delightful town of Cotswold stone houses, for centuries unchanged like somewhere out of a fairytale. As a Middle Ages market town it was a hub of traffic from Wales and the Midlands to Oxford and London. In the mid 18th century, 40 post coaches rattled down its High Street every day and many would overnight at the Bull, which still has the courtyard, the coach house and the stables to prove it. Today the heavy traffic by-passes the town, but its streets remain busy with the shoppers and gossipers who throng its many antique shops, curiosity shops and cafes. Charm and history are everywhere. Within little more than a half-hour radius are Blenheim Palace, home of the Churchills; Oxford, the University city of dreaming spires; Cirencester, steeped in the history of Roman times; Cheltenham, elegant with its Regency Spa and its fine shops; Stratford on Avon, home of Shakespeare. Close at hand is the magic of the Cotswolds, with sleepy villages of honey-coloured stone: a touring prospect of constantly changing attraction including, in Burford itself, the renowned Cotswold Wildlife Park. The Bull at Burford is a luxury Coaching Inn and Brasserie with fifteen unique rooms for you to choose from in the little village of Burford in the heart of the Cotswolds, Oxfordshire. You don't have to travel far to find the perfect winter break - traditional English charm, gourmet dining and attentive service await you at this fantastic little place. 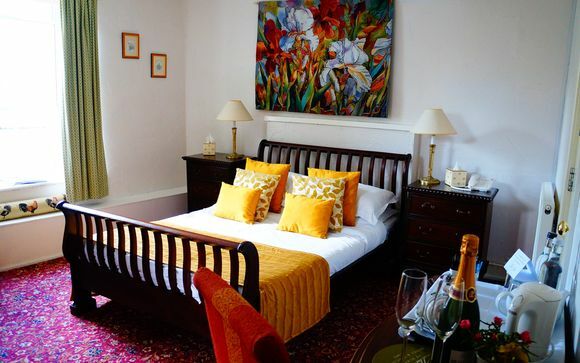 This offer is based on a Double Standard Room or a Four Poster Room. With just 15 rooms available at The Bull, you're sure to find your needs well attended to. Walk into your bright and fresh room, all of which have a history of their own. Some have luxury four-poster beds, which can accommodate an extra person if needed. These include an extra sofa bed, Z-bed or cot for infants. Breakfast is served in The Brasserie at the Bull at Burford, itself a gourmet delight having won a special AA Breakfast Award. Savour delicious flavours in warm, homely surroundings, and get your day off to the perfect start. You can also enjoy your favourite beverages in the traditional pub. Please note: Between 4th - 22nd January the Brasserie will not serve lunch or dinner, and the pub will close at 6pm. Burford is just off the A40 just 19 miles from Oxford, 29 miles from Gloucester and 75 miles from London. Once in Burford head down the High Street and the Bull is roughly half way down on the right - distinctive as the only red brick building.